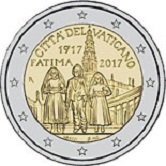 The coin commemorates the 100th anniversary of the Fatima Apparitions. On Sunday May 13th 1917 three shepherd children were pasturing their flock as usual at the Cova da Iria. They were playing when suddenly a bright shaft of light pierced the air. They saw a lady dressed all in white who claimed to be from heaven and said she would appear to them six times. Two of the children later died of flu and one of them became a nun and wrote the Three Secrets of Fátima. Within the inner circle the three children are depicted. In the background is the Basilica Antiga. Standing on the colonnade is a statue of Stephen I. Around the top of the inner circle is the country designation “CITTA’ DEL VATICANO”. Immediately thereunder is the year 1917 and under that the inscription “FATIMA 2017”.At nine o’clock is the mint mark ”R”. Below at six o’clock is the designer’s name “O.ROSSI”.